Directions: State Street to 42nd (south side of roadway). Directions: From Taylor, Mo: North on Hwy-61 (Ave. of the Saints) to 1st LaGrange (south) exit. Exit on the Old Hwy-61 (Business District) & continue 2-blocks past Terrible's Mark Twain Casino to South Street, turn west on South Street (turn off Old Hwy-61 by the Lion's Club Bldg) and continue to South 7th St., turn south on 7th to property (east side of street, see sign). -(OR)- If traveling to LaGrange via the 2nd (north) exit, turn off of the last curve on to 7th Street and continue to property. 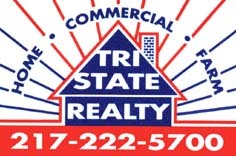 "We need your business - Call us first to sell your Farm or Home! Home Warranty Plans, Affordable Commission Rates, & We pay the advertising!" Let us put your property in the SOLD category.